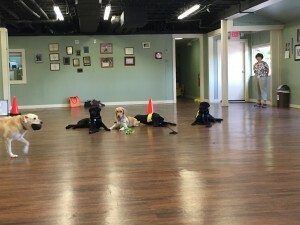 During the Friday morning CCI Puppy Raiser Class we challenged the young dogs by placing them in a group down-stay while Kady retrieved a Kong. 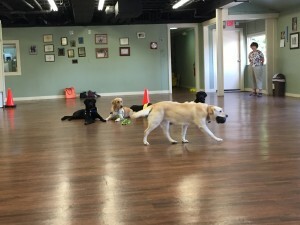 Service dogs must remain calm, composed, confident, cooperative, and focused on task regardless of the environment and regardless of the distractions or conditions present within the environment. The distraction stay task is difficult, especially given the age of the dogs. However, every puppy remained in position. Awesome! !